Do you have a Fruit Salad Family Tree? 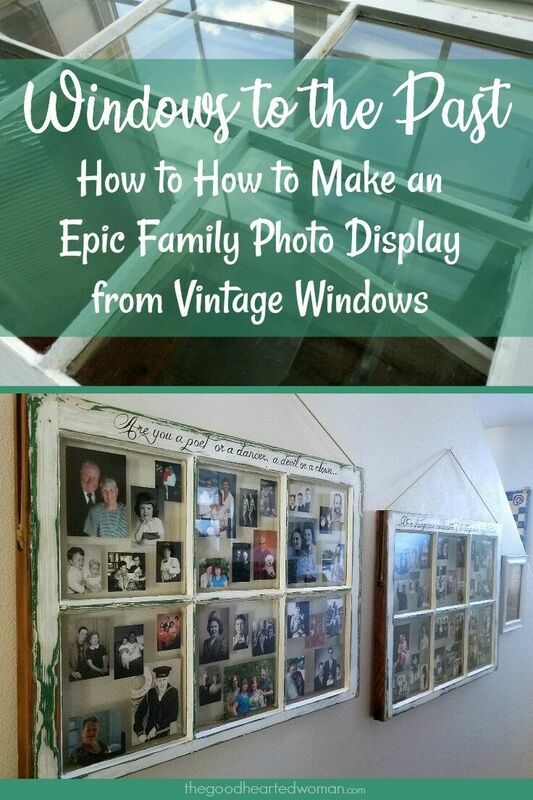 This epic Vintage Window Family Photo Frame Display will finally bring the everyone together in one wonderful place. 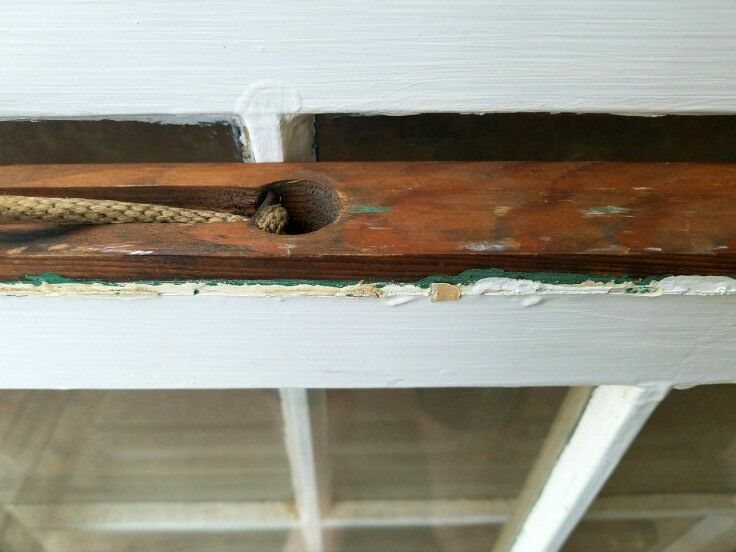 A few years ago, I bought a couple of old window frames at a local salvage store, complete with the original sashing ropes. 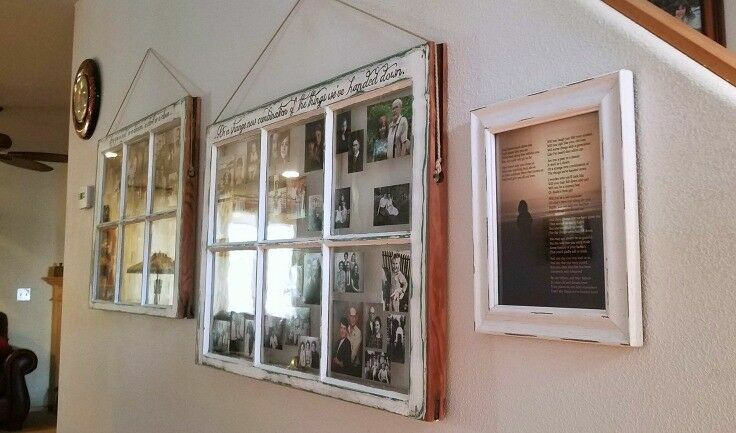 Reclaimed from some ancient Southeast Portland home, my plan was to refinished and use them as frames for family pictures. 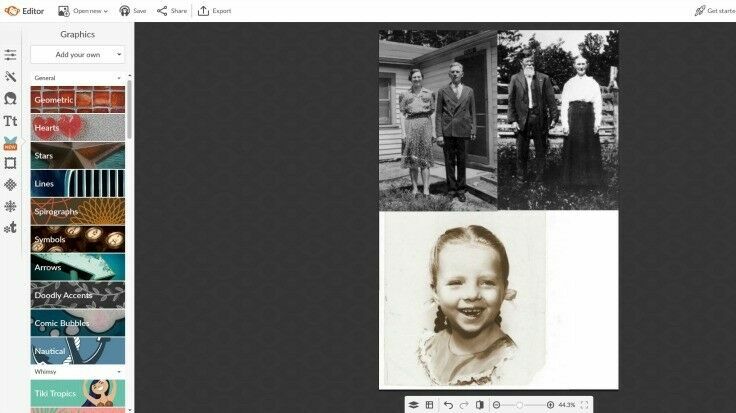 My vision was to create a sort of “Windows to the Past,” and include family photos from recent generations – parents, grandparents, and great grandparents – related to all our kids. 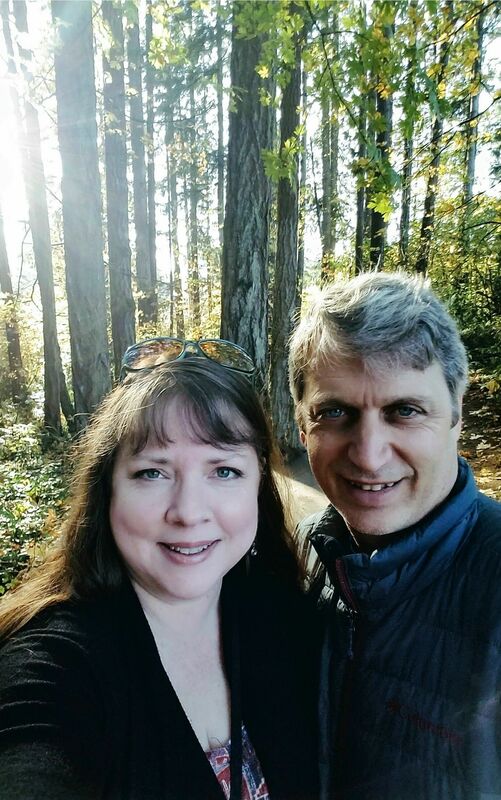 The problem pestering my noggin was that our family – like most families I know – doesn’t really fit on the archetypal “family tree,” with its perfectly spaced branches and carefully curated foliage. Our family tree has extra branches, and broken limbs, and grafted stock, and sprouts and sprigs that spring up from places we never expected. How could everyone – all those unrelated relatives – fit into twelve little window panes and make sense? Ours is a Fruit Salad Family Tree, created from grafted limbs, bright bursts of color, broken branches, and sprouts and sprigs that spring up from places we never expected. Speaking of trees. Years ago, when I raising my young family on five acres in Portland’s rural suburbia, we kept a small orchard of miniature fruit trees. Among the trees we tended was a multi-grafted apple tree, created by grafting the fruiting wood from three different fruit trees onto one rootstock, thus allowing one tree to bear three distinctly different varieties of fruit. In the spring when the apple blossoms popped, our little “fruit salad tree” was the most vibrant and colorful in the orchard. The family that Mr B and I have created is a lot like my little tri-colored apple tree. We are a spirited mix of siblings and steps and halfs, in-laws and out-laws, and grands of all kinds, all grafted together onto one beautiful fruit salad family tree. 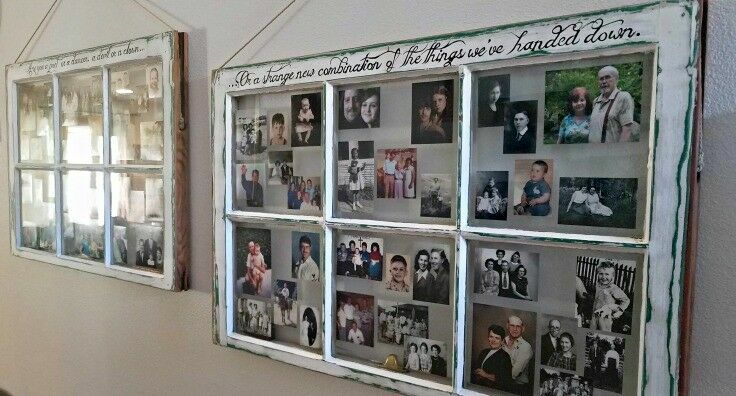 It was important to me that this “Windows to the Past” display be more than just a collection of old family photos: I wanted it to tell our story. 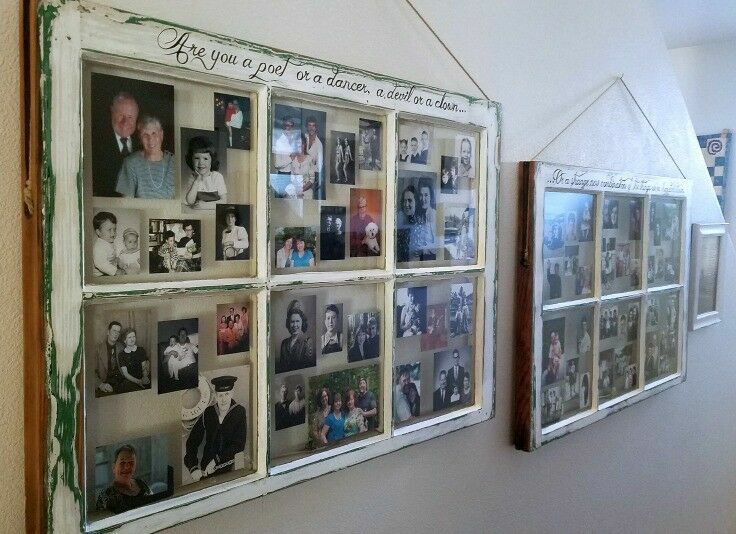 Initially, I considered assigning each grandparent a window and keeping them in their own little box, but that didn’t work for a multitude of reasons. I then considered placing the pictures chronologically, from top left window to bottom right, grouping folks in generations. Nope. That wasn’t right either. Finally, I returned to my original premise: ours is a Fruit Salad Family Tree. So I decided to toss everyone in together and mix it all up. Like fractals in chaos, it was perfect. 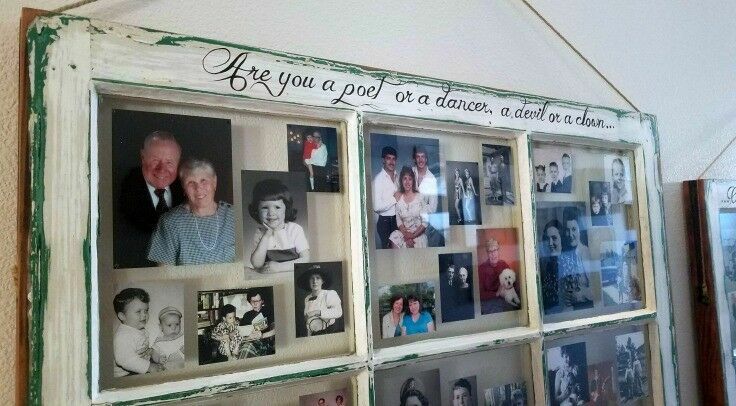 For example, in the pane below, you will find (among others) Mr B’s Nana, my [birth] Mom, my Mama, my Auntie, and my girls’ paternal grandpa. At first, the lack of obvious organization was a concern, but the more I thought about it, the more I liked the idea. 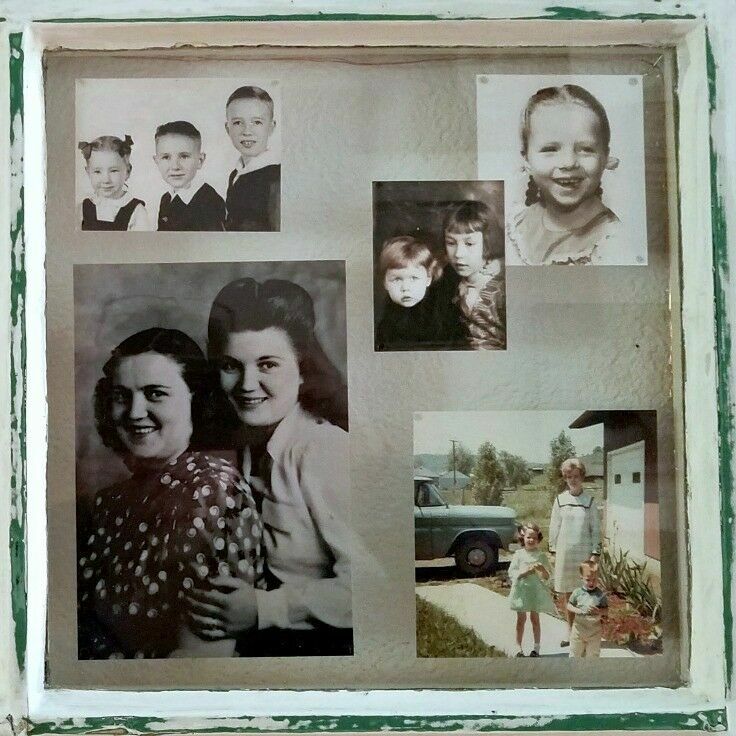 A family photo frame like this opens to wonderful conversations: “See, there’s Grammi when she was little, and that’s Grandma Lila, and there’s Nana. She taught me to make noodles.” Instead of a static exhibit of old, forgotten faces organized in time, it becomes a jumping-off point for family storytellers. Once I had a clear vision, it was time to free our window frames from the “room of unfinished projects” and get the party started. The actual process of restoring the window frames and repurposing them into picture frames was a bit time consuming, but relatively simple and easy. 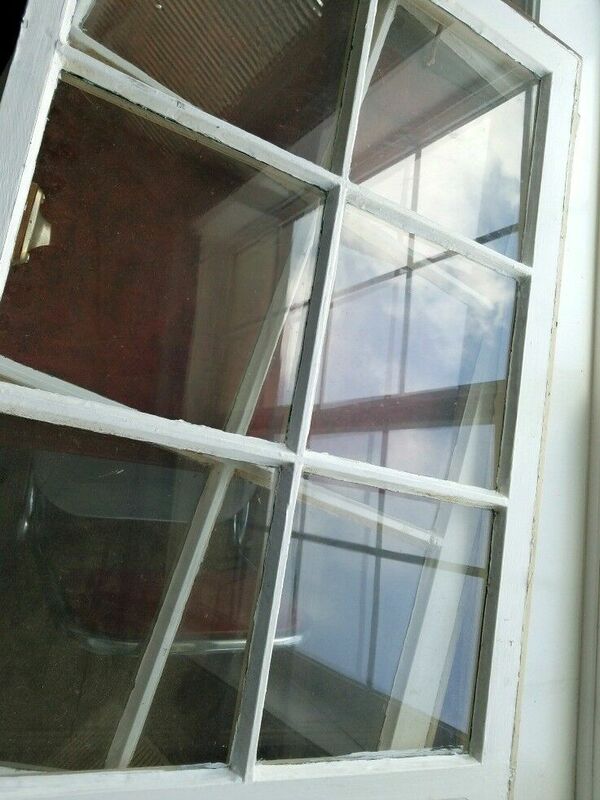 For reference, the panes in my windows were approximately 9″ square. 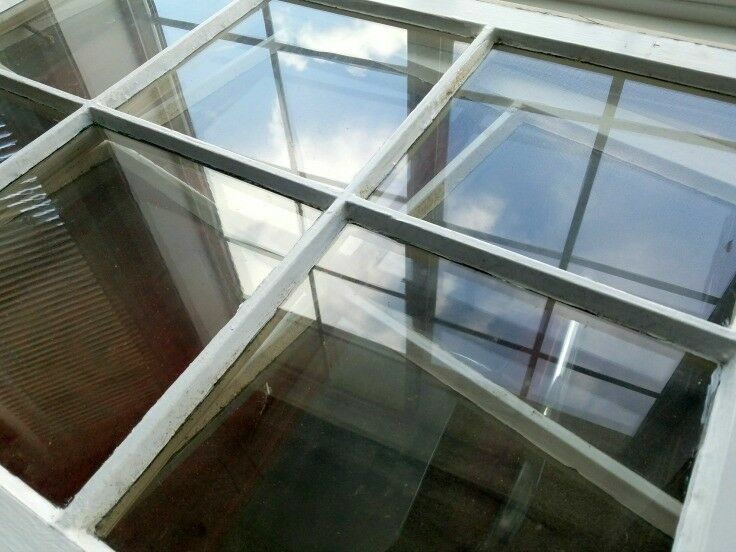 Also, the two windows that I used for the project are similar in size, but not identical. Work outside or in a well-ventilated area. Keep children out of the immediate area. *** LEAD PAINT WARNING – PLEASE READ: If you are questioning whether or not the paint on your window frame contains lead, you can purchase a cheap-n-easy 3-M Lead Check Test Kit . To use, you simply rub the test swab on the paint in question: If the swab is yellow, you’re in the clear. If the swab turns red, you’ve got lead. If you don’t test your paint and the window frames were removed from a home built before 1978, assume that the paint you are working with contains lead and take recommended precautions accordingly. For more information related safety and procedures for working on items that may have been finished with lead-based paint, check out Everything You Need to Know about Vintage Decor & Lead Paint [The Sarah Joy Blog]. 1. Remove sash cords and any extra pieces of frame that you will not be using for the final piece. 2. 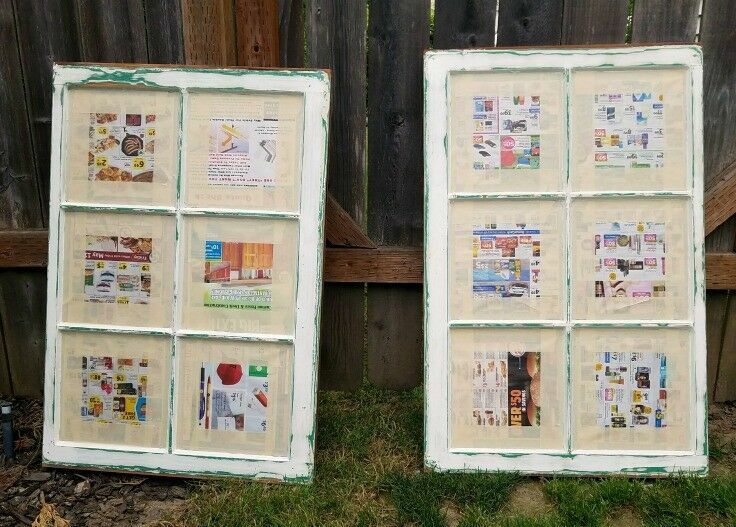 Cover the panes with newspaper or other masking paper and secure with masking tape. 6. Spray with one coat of spray-on matte finish. Allow to dry completely. 7. Resand surfaces with fine grit sandpaper. 8. Repeat Steps 4 – 7 at least two more times, for a total of at least three coats of finish. Allow frames to dry completely, sand one more time, and remove masking paper and tape. NOTE: After I finished sanding and sealing, I used the sashing holes to secure a new cord for hanging. If your window frame does not offer this option, you will need to figure out how you want to hang your frame at this time. 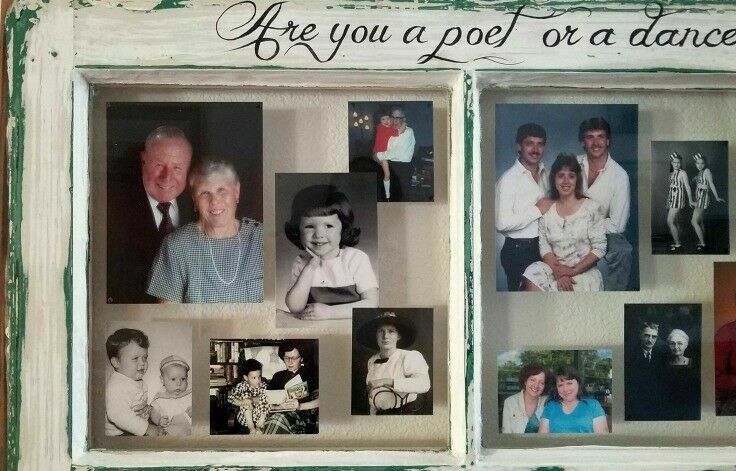 You can use a favorite lyric or quote to establish the theme of your photo display. 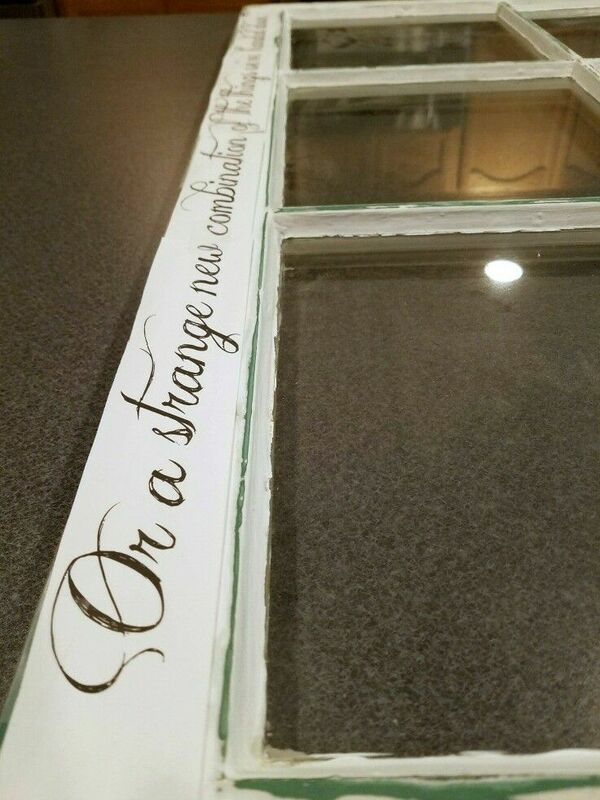 I added these lines to my window frames by meticulously painting them across the top of each windowpane, which turned out alright, but was a super-tedious way to do it. In retrospect, it would have been much easier to have used my Rapidiograph pen , or a Sharpie, or asked one of my Cricutting friends to cut me some vinyl letters. This should have been the easiest part of the project. It wasn’t. Learn from my mistakes – and for Pete’s sake, DO NOT SKIP Step 3! 1. Decide the scope of your display. How many generations will you include? Will you include aunts and uncles, or just direct ancestors? In keeping with the “Windows to the Past” theme, I decided to include only our own generation, our children’s grandparents, great-grandparents, and a few great-great-grands. We did not include any of our grandchildren in the display, and included pictures of our own children only as youngsters. 2. Find and scan every picture you think you might want to use before you start to make any decisions. 4. Separate the pictures into window-pane groups (1 – 7 pictures per pane, depending on the window pane size and the aesthetic you’re going for). 5. Once you have the images grouped, arrange them in a way that makes you happy, and decide how big each one needs to be for the finished project. 6. Reprint the images to size. For this step, I used PicMonkey to create multiple-image prints using their “Design” feature. (You can also do this in Photoshop or Canva, but for this kind of thing, I find PicMonkey to be faster.) Basically, I created a 4×6 design canvas [300 dpi = 1200×1800 px], and then added my images as graphic overlays, sizing them on the design canvas as needed. That way, I could get multiple images on a single print – in the exact sizes I wanted them. 7. Carefully clean each window pane so that it is free of dust and smudges. 8. Arrange images on a paper square cut to the same size as the destination window pane, paying attention to layout atheistic and image overlap. This will be your “image placement map” when you begin to adhere the pictures to the window frame panes. Adhere one tiny glue dot to each corner on the FRONT of the picture, for a total of four dots on each picture. From the back of the window pane, place the image as desired. Use your image map as a guide. Make sure that the image is square to the frame and spaced the way you want in relationship to the rest of the images. Once all of the pictures for that pane are placed, confirm that they are all in the right place. Press the corners of each image in the pane from the back to make sure it is firmly adhered. TIP: One of the great things about using tiny glue dots is that you can add or change a single picture any time without having to redo the entire display. This came in particularly handy when we couldn’t find Mr B’s baby pictures. I completed the project, hung it in the hall, and simply added his baby pics pictures when we found them. I tacked a short string of fairy lights to the back of the frames. (They run on two AA batteries: the battery pack just tucks behind a picture on the bottom of the window sill. I don’t turn the lights on all the time, but they look kind of cool for holidays and celebrations. As I mentioned earlier, I love the lyrics to “The Things We’ve Handed Down.” Sensitive, poignant, and honest; they reflect a parent’s thoughts for the next generations, and are perfectly suited for this project. I printed them out over an image of one of my girls, and hung it in a single-image frame alongside the larger window frames. Those are truly beautiful tributes to both your creative & artistic talents, and to your “fruit salad” family! How lucky they are to have you in the mix! You inspire me! These are beautiful! I love the concept and the writing. I’m not very crafty but I’m going to use your ideas and try this as a family project. Thanks! 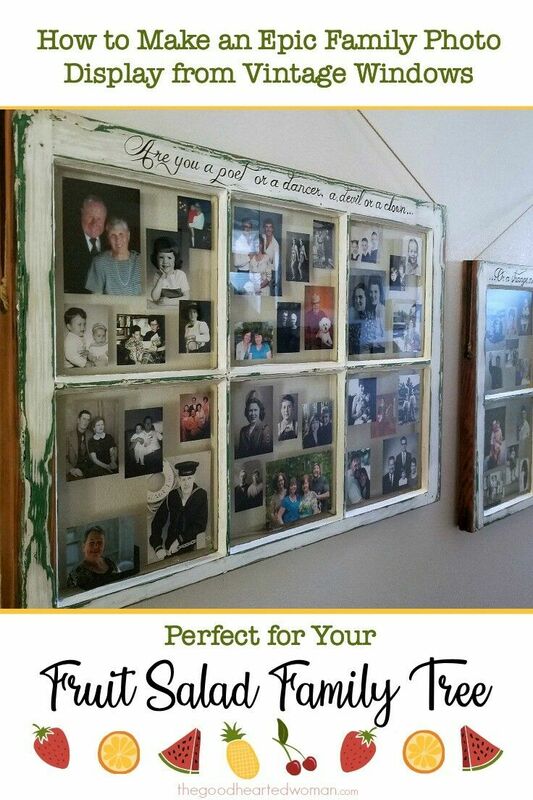 This is such a beautiful way to frame a family tree! 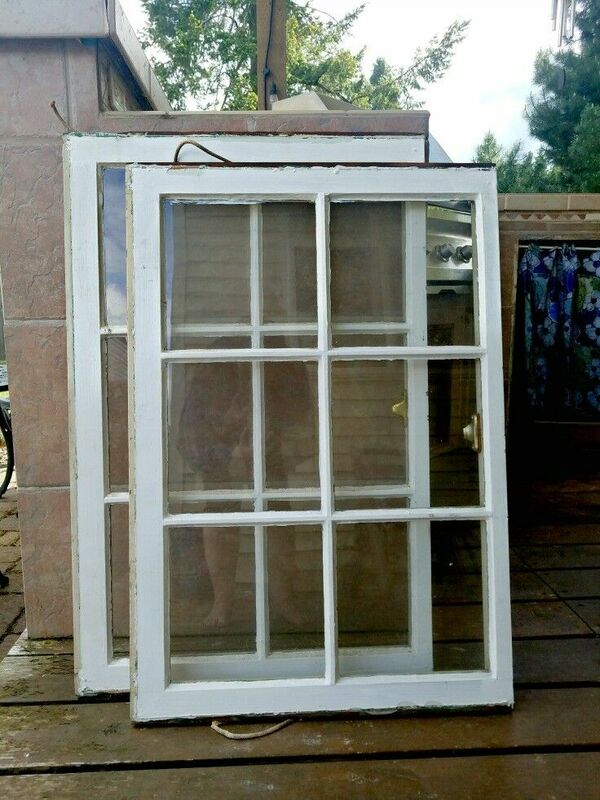 I always see gorgeous weathered windows when I go thrift shopping and this would be such a lovely gift that I think my parents would appreciate. Thanks so much for the creative tutorial! They turned out beautifully. 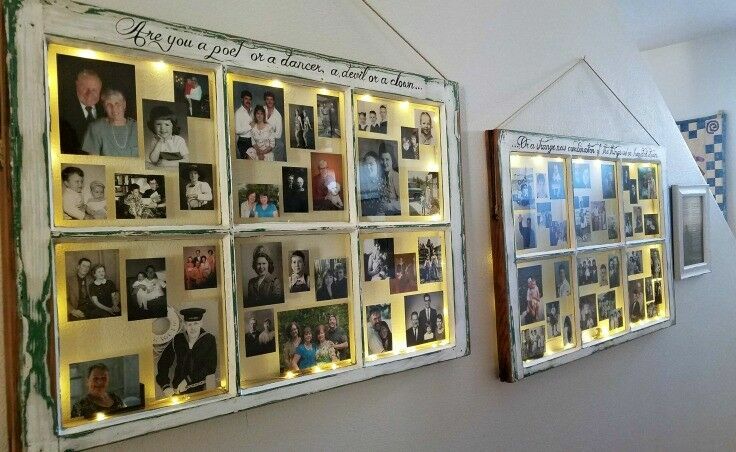 What a lovely way to show off family memories. I love this rustic look and it’s a bonus that it’s much for affordable than buying one at a store! How cool! I love your vision and philosophy of the fruit salad family. It’s true that we can find a lot of joy and love in accepting our family even if things aren’t as linear as one might expect. I love those! So unique and awesome way to tie in the family history! I love how these vintage windows look! Nice way to add a little personal touch to the frames. Oh my goodness, this display is so epic and beautiful. I am certain anyone who comes into your home would pause to take it all in. I love what you did and the care you took with your family history! What a fun and stunning photograph display! I can see this fitting well into any home decor and being the spotlight of a hallway! Ohhhh I LOVE this idea so much. 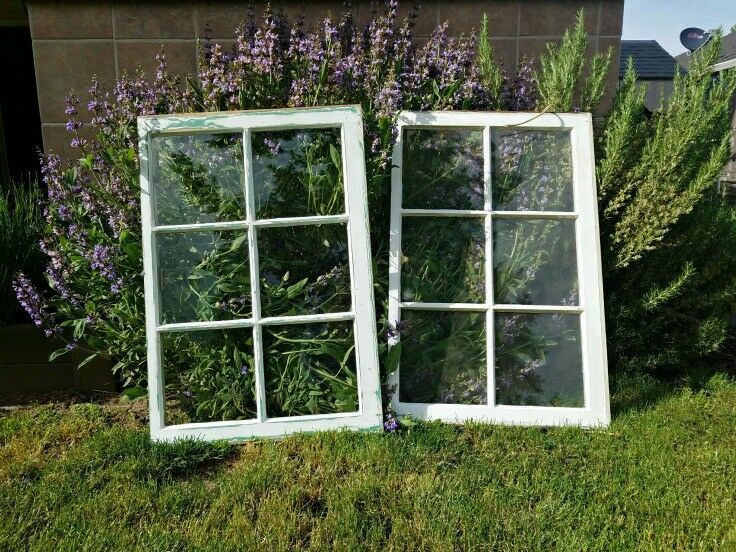 I have two old windows EXACTLY like the ones you used (probably same dimensions and everything), but they’ve just been sitting in my garage for the last 2 years while I wait to finally decide how to use them. This is the idea I’ve been waiting for! Thanks for the inspiration! Glad I could provide a spark for you, Mary! I’d love to see how yours turns out. I lover this idea! Now I just need to find some old window frames!! What a fun project! Such a cute way to use old windows.